Weaning (or should I say “introducing solids”) wasn’t something that I had given much thought to until my Week by Week book mentioned it when the little man turned 4 months old. I had also had friends who had weaned their children early, before 6 months, and panicked that I hadn’t even thought about it! From around 4 and a half months I saw that the little man was much more inquisitive when we were eating, and stared at us for ages. I then started testing the waters by putting bits of food near his face to see what his reaction was – nothing. I knew then that he wasn’t ready. At 5 months old I attended an introducing solids workshop, which prepared me well with what I should be looking for – able to hold his head up, able to sit up, an interest in food etc, and some good tips on what my baby should be eating (veg first! ), and what foods to avoid until a certain age. I left the workshop well equipped with information, however couldn’t believe that my baby boy was nearly ready for food! On his 6 month birthday we gave him his first taste of food – we went for a broccoli puree. I didn’t quite get the reaction that I expected, as although he took it cautiously from the spoon that I offered him, he also got quite upset after a few spoonfuls. No one prepared me for that! From all of the things I saw on social media I was expecting a happy, giggly baby – not the case! Things got a bit better day by day, and I gave different veg purees for the first 2 weeks. I then introduced fruit purees. I found purees very easy to make as I have a steamer, and a nutribullet which whizzes them down in seconds. I then bought some containers to store them in the freezer, which meant I wasn’t preparing food every day. 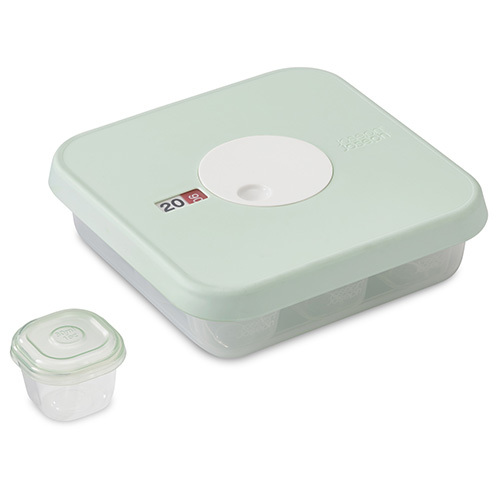 The Joseph JosephDial™ Baby food storage containers are great for storing purees. They are BPA free, and come with a clever rotating dial in the lid for you to date the contents without the need of labels / pens! These are perfect for the first few months of weaning. If you would like the opportunity to win one of these containers, then enter my competition below! Competition is open to UK residents only from 23rd April to 7th May 2017. ← 8 months into being a mum – how do I feel?